Although it has been nearly 35 years since Rodgers & Hammerstein's final collaboration, THE SOUND OF MUSIC, took the Great White Way by storm, it was in fact a new Rodgers & Hammerstein musical that ushered in the fall season on Broadway. 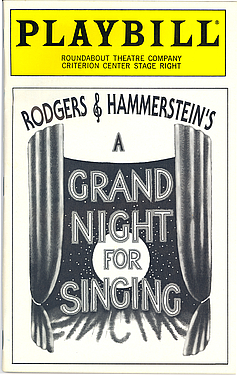 Rodgers & Hammerstein's A GRAND NIGHT FOR SINGING! was presented in a limited engagement at the Roundabout Theatre from October 13 to January 1 and this "charming musical revue" (Associated Press), "a splendiferous show of songs" (New York Post), was hailed as "a delight" (TheatreWeek) and "one enchanted evening" (Newsweek). We couldn't agree more. Two of the major ingredients needed to create a first-rate revue are taste and imagination, both of which are in abundant evidence in this fresh take on the R&H canon, conceived and directed by Broadway veteran Walter Bobbie. The innovative musical arrangements are by Fred Wells; the gorgeous orchestrations by Michael Gibson and Jonathan Tunick are scored for six acoustic instruments - piano, bass, percussion, reeds, cello and harp. As USA Today reported, A GRAND NIGHT FOR SINGING! is "enough to restore one's faith in the future of the revue and the durability of Rodgers and Hammerstein." We are delighted to announce that Rodgers & Hammerstein's A GRAND NIGHT FOR SINGING! will be available for production later in the year - watch this column for an update. PLEASE NOTE: Effective immediately, the amateur licensing division of The R&H Theatre Library has relocated to 229 West 28 Street, 11th floor, New York, NY 10001. Tel: (212) 564-4000; Fax: (212) 268-1245. Please direct all correspondence regarding amateur performances to that address. All correspondence pertaining to professional performances should continue being sent to the 1633 Broadway address. 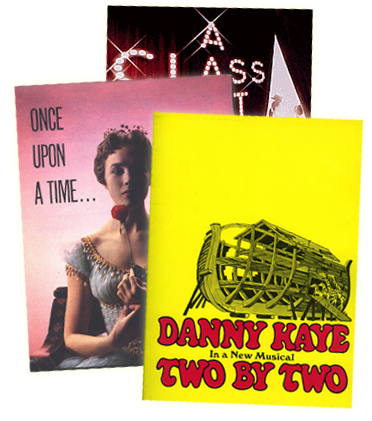 Meanwhile, you might consider these terrific revues available from The R&H Theatre Library. More than any popular songwriter in recent memory, Harry Chapin was a storyteller. He celebrated the extraordinary lives of ordinary folks, reminding us through comedy and pathos that life's emotional journey is universal. The most inherently theatrical of Chapin's songs have been assembled into LIES & LEGENDS: THE MUSICAL STORIES OF HARRY CHAPIN. written for a cast of 2 women and 3 men, LIES & LEGENDS includes such songs as "Taxi," "Cat's In The Cradle," "Mail Order Annie" and "Halfway To Heaven." Duke Ellington's early days at The Cotton Club through his widening acceptance abroad are profiled in SOPHISTICATED LADIES, the stylish, big and brassy retrospective that garnered 8 Tony Award nominations including Best Musical. This high-stepping salute inspired by the glamorous nightlife and sensuous highlife of the man who lived to love has brought audiences and critics alike to their feet throughout the world. SOPHISTICATED LADIES is written for 3 women, 4 men and a singing- dancing ensemble, and features such songs as "Satin Doll," "Take The 'A' Train," "Don't Get Around Much Anymore" and "It Don't Mean A Thing." The songs of Randy Newman have been deftly woven into a contemporary "minstrel" show with the sociological punch that has made Newman America's foremost musical satirist. Set in 1969, THE MIDDLE OF NOWHERE finds five disparate characters stranded in a bus depot in a backwater Louisiana town. As the rain pours down, their personas pour forth in a succession of stylized vaudevillian set pieces. THE MIDDLE OF NOWHERE is written for 1 woman and 4 men and includes such songs as "I Think It's Gonna Rain Today," "Short People," "Lonely At The Top" and "You Can Leave Your Hat On." Ben Bagley, the proven master of revue, has concocted a tongue-in-cheek historic cavalcade from the rare jewels of Cole Porter's vast musical treasure trove. THE DECLINE AND FALL OF THE ENTIRE WORLD AS SEEN THROUGH THE EYES OF COLE PORTER scrutinizes the period between 1919 and 1945 when, indeed, some considerable declining and falling went on. Here, the generally unsuspected meanings behind many of Porter's songs indicate that during times of chaos and destruction, Porter saw the world with an impudent, highly sophisticated and indomitably euphoric gaze. He created a world of his own through his songs, and made ours richer in the process. THE DECLINE AND FALL...is written for 3 women and 2 men and can easily be expanded as desired. The score includes "Red, Hot And Blue," "Gigolo," "Make It Another Old Fashioned, Please" and "I Happen To Like New York." From their first hit song in 1925 through their final show-stopper in 1943, the prolific team of Rodgers & Hart were consistently redefining the musical theatre with their wit, freshness and intelli-gence. RODGERS & HART: A CELEBRATION is a rousing pastiche, the first act setting the stage for romance while Act 2 is comprised of their more satiric gems. A brief narration highlights their careers but it's the timeless songs that explain their success. RODGERS & HART: A CELEBRATION is written for 3 women and 3 men and can be easily expanded as desired. The score includes "My Funny Valentine," "Where Or When," "The Lady Is A Tramp" and "Ten Cents A Dance."